Over 50 years of proven expertise! 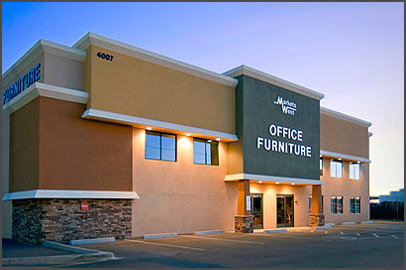 Markets West specializes in new, used and refurbished office furniture. Our showroom in Phoenix is stocked with inventory and one of our friendly sales associates will assist you. Our inventory contains modular office furniture systems/cubicles, computer furniture, desks, chairs, tables, conference tables, reception desks and furniture, file cabinets, and much more. If you are looking for something in particular please let us know. DELIVERY & INSTALLATION AVAILABLE IN PHOENIX AND SURROUNDING AREAS - Contact us for shipping/delivery availability and pricing to your location. note: We serve Phoenix and surrounding areas such as Scottsdale, Tempe, Mesa, Chandler, Gilbert, Glendale, Peoria, Avondale, Buckeye, Sun City as well as Tucson and Flagstaff. Some of our product is available for shipping througout the US. Our Office Star lines (Napa, Kenwood, Sonoma) are available for delivery and setup in the New York/New Jersey area as well. Markets West has one of the largest selections of desks available anywhere. We carry more lines, more styles and colors than most outlets because we know everyone does not have the same taste in case goods. Chances are, if we don't have what you are looking for, we can get it, and usually at a better price than what you're used to! MARKETS WEST offers some incredible opportunities in modular furniture. Free computer aided design and layout, personalized service with space planning at the job site. Over 50 years experience and industry contacts to share with you. We offer refurbished Herman Miller products, available in many color choices. The outstanding quality of Herman Miller products is legendary in the industry for ease of configuration and durability, so Markets West has specialized its refurbishing department to be the very best at reworking Herman Miller. MARKETS WEST specializes in ergonomic design seating, we probably have the best selection of office chairs in the valley. In this day and age, quality is important and we require all of our new chair suppliers to provide warranty service on all of the products we offer, some even have lifetime warranties. They are available in a myriad of beautiful fabrics and wood colors. A good comfortable chair will greatly increase your employee productivity, not to mention your own personal comfort. Chairs are very subjective and best selected in person by testing each one. We would be pleased to assist you with your selection at our showroom. Here are just a few of the many types and styles available to you. MARKETS WEST conference furniture selections offer many different combinations of laminates and wood types. We carry over 400 different colors and patterns to choose from, offering Nevamar, Wilsonart, Pionite and Formica laminates. Custom wood species and finishes are also available, sizes can be made to order. MARKETS WEST always has your filing needs covered either with our immediate stock program or our extensive collection of used and new "scratch & dent" file cabinet inventories. We carry a full line of vertical and lateral files from manufacturers like Hon, Office Impressions and FireKing.